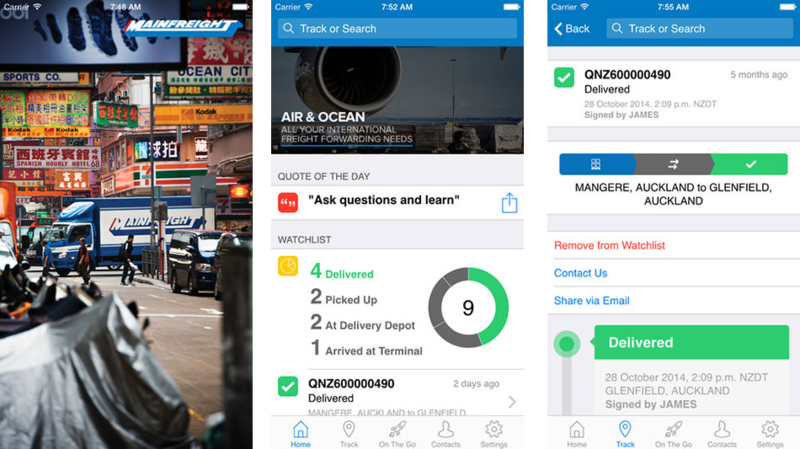 A beautiful new app suite that reflects Mainfreight with an app experience second-to-none and creates an opportunity to impress Mainfreight’s customers, but also their customers’ customers. These apps are a significant upgrade from the original version, being a complete rewrite using PhoneGap and Sandfield mobile frameworks. During the design phase it was recognised that we want a platform that allows Mainfreight to deliver functionality in an easy and in a timely manner across all its platforms. Through development of a Sandfield designed “UI Kit” we are able to build features for use in the responsive website and also into the mobile application with over 85% code reuse across platforms. UI Kit also recognises that the features may take on a different look or exhibit device specific UI experiences. UI Kit delivers a first-class native experience on the web, mobile, tablet, iOS, Android and Windows Mobile. The initial release of the app allows both Mainfreight’s customers and their customers' customers to track and monitor freight movements. Items can be added to watchlists and push notifications can be received if desired. For logged-in verified customers, the “On The Go” feature automatically populates with all current activity without any need for the user to configure anything. Items can be easily filtered and drilled through to from a clean donut-chart style interface. Watch this space as we have some great features planned. A particularly interesting framework feature is the ability for persisting of watchlist and recent tracking across all platforms. With the next release of mainfreight.com, if you add an item to your watchlist on the tracking website, it will be automatically added to the smartphone apps. This concept of continuity is something we plan to support for future features across the Mainfreight customer facing application suite, where for example an order could be started on a mobile device, automatically saved (even if incomplete), and then able to be completed on a tablet, desktop computer, or even another mobile device. Mainfreight prides itself on it’s culture and unique team spirit that is the foundation of its competitive advantage. The app aims to reflect these unique characteristics with features sections on the home screen for promoting Mainfreight stories, services, quotes of the day, news, and an investor centre. The apps rely heavily on the Identity Index (“IDi”) which is a global index of every Mainfreight freight item worldwide. The IDi allows almost instant “Google like” searches and the ability to show activity from any of the systems used globally by the Mainfreight Group. A highly optimised custom database design using the latest memory optimised table technology made available in Microsoft SQL Server 2014 Enterprise Edition is a key component of the IDi solution.